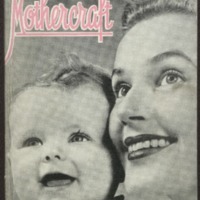 Founded in 1931 by Phyllis Dorothy Cilento(1894-1987), the Mothercraft Association of Queensland aimed to educate women in all areas affecting maternal and child health. Their magazine does so with a cross section of advice regarding the importance of vitamins, and how to incorporate them into food before recommending to mothers what they should feed their children for breakfast, lunch, afternoon tea, and dinner. 25 v. : illustrations ; 24 cm.